The historical Egeskov Castle on Funen is one of Europe’s finest renaissance buildings. The family at Egeskov Castle enjoy having guests at the castle, in the park, in the big play-forest and the many inspiring exhibitions in the castle’s beautiful farm buildings. The castle and grounds are filled with wonders, including three mazes, a motorcycle- and a classic car exhibition, a tree-top walk, a unique collection of dresses and an old smithy. Egeskov Castle is for a great attraction both for children and adults. Your kids can play in Europe´s largest playground. Egeskov has 8 exhibitions and beautiful gardens. Popular activities are also treetop trails and segway activities. In 1967, the Veteran Car Museum was opened in the impressive building which used to be a barn and, over the years, the museum has been extended to include several of the surrounding farm buildings. Egeskov means oak forest - and the legend says that an entire forest of the trees was felled around 1540 to form the piles the castle stands on. The castle, as we see it today, was built by Frands Brockenhuus and was completed in 1554. A few years before this, he had married Anne Tinhuus who had taken over the original estate from her parents. In the more than 400 years that have passed since it was built, various families have lived in the castle. During this period the castle was developed into an up-to-date model farm with its dairy, power station and railway track to Kværndrup, and this formed the economic basis for the large, modern farm. The world-renowned author Hans Christian Andersen visited Egeskov on two occasions, and one of these visits was on August 16 in 1842. The visit at the castle made a deep impression on him, and in his diary he writes about Egeskov's history, describing the garden and buildings. In the garden, he concludes that it is "one the largest and most beautiful in Funen - and is still today. The park has been open to the public for several generations and has remained unchanged since 1959 when the restoration of the historic grounds commenced. The natural fauna in the summer captivate the visitors in its many kinds of plants and flowers. In 2015 Egeskov Castle got the "TripAdvisor Certificate of Excellence." 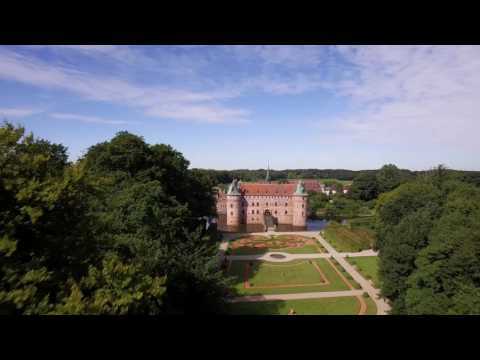 In 2012 Egeskov Castle won the "European Garden Award" and "Best European historic garden." Frederiksberg Palace lies on top of Valby Hill overlooking the beautiful Frederiksberg Garden in the Copenhagen district of Frederiksberg.